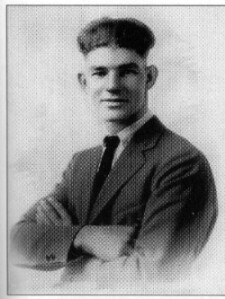 Deputy Sheriff Eugene Moore was shot and killed by the Bonnie and Clyde Gang when Deputy Moore asked them, and several intoxicated friends, to put a bottle of whiskey away. Deputy Sheriff Moore arrived at at a dance with Sheriff C.G.Maxwell. The dance was held at an outdoor pavilion in Stringtown, Oklahoma. Spotting a suspicious vehicle parked behind the bandstand with two men sitting inside, Sheriff Maxwell and deputy Moore approached the car and saw an open container of whiskey. Sheriff Maxwell announced to the two men "You can consider yourselves under arrest," not knowing the two men were Clyde Barrow and Raymond Hamilton, both wanted for murder. Barrow and Hamilton both opened fire on the two lawmen wounding Sheriff Maxwell and killing Eugene Moore before he could draw his weapon. Deputy Moore was survived by his wife and three children. He is buried in the Rose Hill Cemetery, Calera, Bryan County, Oklahoma. The Bonnie and Clyde Gang was responsible for the murder of law enforcement officers in four states - Arkansas, Missouri, Oklahoma, and Texas - between 1932 and 1934. Bonnie Parker and Clyde Barrow started their criminal career by robbing banks and quickly became notorious murderers wanted for the murders of nine law enforcement officers. The two criminals were finally shot and killed in Louisiana when they were ambushed by a task force of Texas and Louisiana officers. I recently watched “The Highwaymen” which is the story of the hunt for and the eventual justice brought to Bonnie and Clyde. This film, in my humble opinion, unlike the previous movies, acknowledges and shows respect for the Law Enforcement Officers who lost their lives to these animals and does not show them to be any kind of folk hero. It was long overdue. Though the name of each and every Officer is not mentioned, some are and I believe the sacrifice by all is honored. God Bless you, Deputy Sheriff Moore and may your eternal rest remain ever peaceful, Brother.